“I just have no words,” Suarez said. “I don’t think I can speak English or Spanish right now. I have no words for what I’m feeling right now. Behind Suarez and Busch, Paul Menard finished third, followed by Jones and Sadler. Suarez is the sixth foreign-born driver to win in the NASCAR’s No. 2 series. This was the first victory and 11th top-10 finish in 2016 for Suarez. He leads the point standings by 18 points over Elliott Sadler. Suarez ended up beating his boss as he also drives a limited schedule for Kyle Busch Motorsports in the NASCAR Camping World Truck Series. “The Kyle Busch School of Charm finished 1-2-4 today, so not too bad,” said Busch, who led 88 laps. “Obviously we want to win. We thought we should have won. We had the best car for the majority of the race there, but not the last 20 laps or so—just got really loose on me. When the race began, it looked as though Suarez would not be in position for the win, especially after a pit road speeding penalty during the first caution of the race on Lap 29. After exiting pit road first, Suarez had to drop to the back to serve the penalty. This move set the tone for the rest of the afternoon until the final couple laps. The frustrated Suarez started to slowly work his way through the field. Meanwhile his teammates ran first and second. That would not be the only adversity Suarez would face on the afternoon. Midway through the race, Suarez lost his clutch in his car, making pit stops challenging. With 13 laps to go, Suarez made a run. He was able to pass Menard, Jones and Elliott Sadler to move to second. At that point he quickly set his sights on the race leader. Over the final 10 laps, Suarez started to slowly cut into Busch’s lead. Suarez nosed in front of Busch as the two took the white flag at the start-finish line. 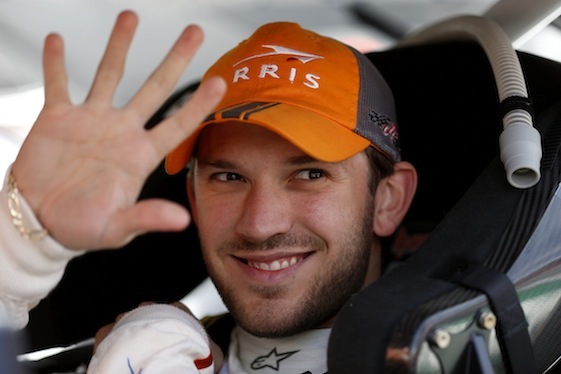 (6) Daniel Suarez, Toyota, 125. (5) Kyle Busch(i), Toyota, 125. (12) Paul Menard(i), Chevrolet, 125. (2) Erik Jones #, Toyota, 125. (3) Elliott Sadler, Chevrolet, 125. (9) Joey Logano(i), Ford, 125. (1) Alex Bowman, Chevrolet, 125. (4) Justin Allgaier, Chevrolet, 125. (17) Darrell Wallace Jr, Ford, 125. (15) Brandon Jones #, Chevrolet, 125. (8) Brennan Poole #, Chevrolet, 125. (10) Ryan Sieg, Chevrolet, 125. (7) Blake Koch, Chevrolet, 125. (11) Ryan Reed, Ford, 125. (13) Ty Dillon, Chevrolet, 125. (18) Ross Chastain, Chevrolet, 125. (20) Garrett Smithley #, Chevrolet, 125. (14) Brendan Gaughan, Chevrolet, 125. (24) Ryan Preece #, Chevrolet, 125. (21) JJ Yeley, Toyota, 124. (22) Jeremy Clements, Chevrolet, 124. (16) Justin Marks, Chevrolet, 124. (26) Ray Black Jr #, Chevrolet, 123. (19) Dakoda Armstrong, Toyota, 122. (29) Joey Gase, Chevrolet, 121. (30) Harrison Rhodes, Dodge, 120. (37) Martin Roy, Chevrolet, 118. (31) TJ Bell, Chevrolet, 117. (36) Mike Harmon, Dodge, 116. (38) Todd Peck, Ford, 116. (32) Derrike Cope, Chevrolet, 115. (35) Chris Cockrum, Chevrolet, Accident, 82. (23) Jeff Green, Toyota, Transmission, 75. (28) BJ McLeod #, Ford, Transmission, 70. (33) Mario Gosselin, Chevrolet, Vibration, 41. (34) Morgan Shepherd, Chevrolet, Oil Leak, 16. (39) John Jackson, Toyota, Clutch, 13. (40) Josh Williams, Chevrolet, Overheating, 11. (27) Josh Wise(i), Chevrolet, Rear Gear, 8. (25) Matt DiBenedetto(i), Toyota, Rear Gear, 3. Average Speed of Race Winner: 155.952 mph. Time of Race: 01 Hrs, 36 Mins, 11 Secs. Margin of Victory: 0.280 Seconds. Lap Leaders: A. Bowman 1-11; E. Jones # 12-28; E. Sadler 29; J. Yeley 30; K. Busch(i) 31-67; E. Jones # 68; P. Menard(i) 69; D. Suarez 70-71; K. Busch(i) 72-99; E. Sadler 100; K. Busch(i) 101-123; D. Suarez 124-125. Leaders Summary (Driver, Times Lead, Laps Led): K. Busch(i) 3 times for 88 laps; E. Jones # 2 times for 18 laps; A. Bowman 1 time for 11 laps; D. Suarez 2 times for 4 laps; E. Sadler 2 times for 2 laps; P. Menard(i) 1 time for 1 lap; J. Yeley 1 time for 1 lap. Top 10 in Points: D. Suarez – 452; E. Sadler – 434; T. Dillon – 416; E. Jones # – 397; J. Allgaier – 388; B. Jones # – 388; B. Gaughan – 386; B. Poole # – 373; D. Wallace Jr – 340; R. Reed – 301.